“Dairi Coffee will have the best competitiveness”, said Ir. Agus Bukka to Dr. Sabam Malau in an interview at the Regent’s office in Sidikalang. Picture:(from left to right) Bharaty, Denny Indra Simson Simangunsong STP, Ir. Agus Bukka, Dr. Sabam Malau, Bintoha Angkat SP, Ir. Relly Tarigan. Photo taken in the lobby of regent office. Sidikalang is the capital city of Dairi Regency of North Sumatra of Indonesia. Ir. 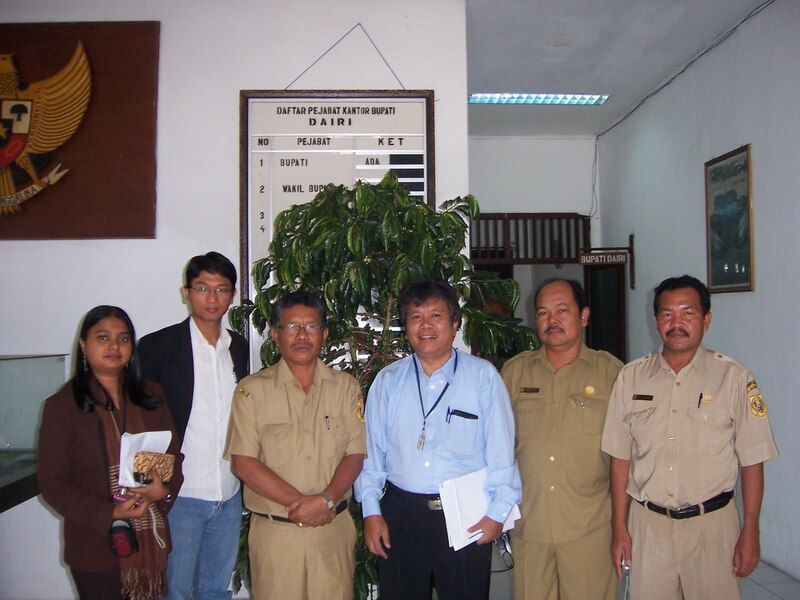 Agus Bukka is the Head of Forestry and Estate Department of Dairi Regencial Goverment, while Dr. Sabam Malau is Chairman of NSCF-North Sumatra Coffee Forum. Ms. Bharaty (the RACA Coordinator USAID AMARTA) and Denny Indra Simson Simangunsong, STP (the RACA manager in Karo Regency) were also attending the meeting. The interview was conducted after referring of the Dairi regent who was also interviewed before (see page Dairi Coffee or Sidikalang Coffee is Already Very Famous). The followings are some of the interview results. Sabam Malau: Would you please tell us the importance of Dairi Coffee? Agus Bukka: Coffee has a very great importance. Among all commodities, Coffee has the biggest value of economy in Dairi. Coffee is the most important commodity of Dairi. Around 30% of the entire Dairi citizens 270,053 persons or around 67,000 citizens drink coffee every day, three glass per day per capita. The number of coffe drinkers increases. The number of coffee growers are 18,642 households. Arabica coffee are planted on 10,411 ha consisting of 2,305 ha of unyielding plants, and 7,902 ha of productive plants, and 201 ha of unproductive plant. Total production of Arabica coffee bean are 10,733 ton/year, with productivity 1,359 kg/ha/year of coffee bean. Robusta coffee : totally 8,495 ha consisting of 4,534 ha of productive plants, and 3,961 ha of unproductive plant. Total production of robusta coffee bean are 2,861 ton/year, with productivity 631 kg/ha/year of coffee bean. The sale of bean of Arabica coffee was around IDR 536.6 billion at IDR 50,000 per kg of bean while the sale of bean of robusta coffee was around IDR 51,5 billion at IDR 18,000 per kg of bean. Sabam Malau: What is your program to increase coffee area? Agus Bukka: To grant qualified seedings of true coffee. Sabam Malau: The coffee productivity is very low. What is your program to increase it? Agus Bukka: The coffee farmers must use the good agriculture practice. Sabam Malau: As long as I know, there is an ironic situation here in Dairi. I mean, coffee is the most important commoditiy of Dairi but coffee receives only a very little budget for development programs. How big is your budget for all those programs you mentioned? Agus Bukka: We have done our best. Finance is the limiting factor. We don’t have a big budget, we have a very small budget for coffee development. Would you like to help the coffee farmers? Sabam Malau: How is the picture of Dairi Coffee in the next 5 years? Agus Bukka: Dairi Coffee will have the best competitiveness. Sabam Malau: How great is the potential of new investment? Agus Bukka: Dairi still has abundant of nonplanted area.